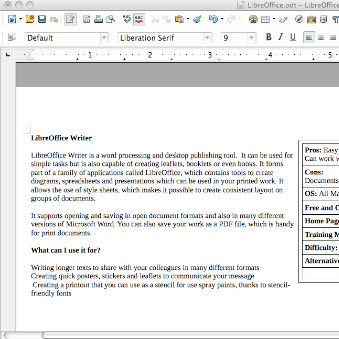 LibreOffice Writer is a word processing and desktop publishing tool. It can be used for simple tasks but is also capable of creating leaflets, booklets or even books. 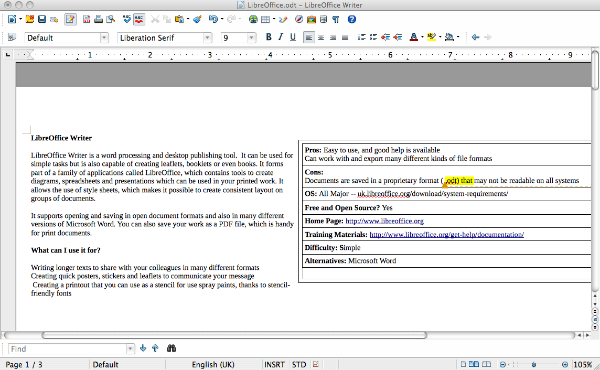 It forms part of a family of applications called LibreOffice, which contains tools to create diagrams, spreadsheets and presentations which can be used in your printed work. It allows the use of style sheets, which makes it possible to create consistent layout on groups of documents. It supports opening and saving in open document formats and also in many different versions of Microsoft Word. You can also save your work as a PDF file, which is handy for print documents.